Did you know that cleaning your teeth is easy as eating a few certain foods? That’s right, you heard correctly. Of course, sugar is the tastiest of foods, but let’s not stray away from an important lesson: What foods you are consuming can have profound effects on your overall dental health. More importantly, which actually help clean your teeth? This food group contains some of our favorites that are natural abrasives. You can get a good tooth scrubbing from eating apples, strawberries or kiwis, all which contain vitamin C, which is considered to hold cells together. Without vitamin C keeping gum cells intact, they can become tender and vulnerable to disease. Apples are also a naturally detergent food which help clean your teeth. Wait, it gets better – pineapples are known to actually help whiten teeth as they contain an enzyme called bromelain, which acts as a natural stain remover. The enzyme also aids in the breakdown of that sticky film of bacteria on your teeth called plaque. Getting rid of plaque is essential since it contains acids that erode the enamel of your teeth. Carrots, pumpkins, sweet potatoes and broccoli all contain vitamin A which is necessary for the formation of tooth enamel. Veggies that are crunchy such as cauliflower, broccoli and cucumbers will help to clean and massage gums due to the increased amount of chewing involved. In fact, eating any crunchy vegetable helps clean your teeth. Onions and garlic contain antibacterial sulfur compounds which prevent tooth decay because they reduce the bacteria in your mouth. The preferable way to consume them is raw because cooking destroys the tooth friendly compounds. Celery produces teeth protecting saliva which neutralizes acid that causes cavities and demineralization. Broccoli has iron that forms a barrier which is acid resistant, protecting enamel while ginger is a natural anti-inflammatory agent. Further, chewing on fresh herbs such as cilantro, parsley and mint aid in the decrease of odors from bacteria buildup. It’s better to eat them raw since dried herbs have nutritional lack, but they can be used in a mouth rinse, which you can whip up yourself. And basil even helps reduce bacteria because it acts as a natural antibiotic. Milk and Yogurt are good choices because of their low acidity content, which basically means your teeth will be worn down less. They are also low in the sugars that induce decay. Milk is a great source of calcium which is the main component to healthy teeth and bones. Cheese is rich in calcium, protein and phosphorous. These elements are cavity fighting agents that help buffer the acids in your mouth. The calcium and phosphorous in cheese assists the pH in the mouth, creates saliva, destroys the bacteria that causes cavities and disease and rebuilds tooth enamel. Chicken, Turkey, Beef and Eggs have within them phosphorous which which is one of the most vital minerals of teeth and bone. Salmon contains vitamin D and calcium. The breakdown of nuts within the mouth can create little “scrubbers” to remove plaque. Sesame seeds in particular do a good job of this as well as containing calcium. We here at Salmon Creek Family Dental, your dentist in Salmon Creek and Vancouver, WA, we recommend a balanced diet because it’s not only great for your body and well being, but most especially for your mouth. At the end of the day however, you need good dental hygiene. 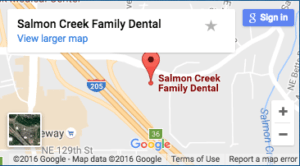 Make sure to brush and floss and come see us at Salmon Creek Family Dental for your regular check-ups.